Runs are not limited to the right hand, but can be used quite effectively in the bass line as well. In fact, these types of bass runs dominated the playing of Rudy Atwood, a man whose radio presence on the Old Time Revival Hour helped define the evangelistic style. Often, the left hand is considerably less agile than the right hand, so care must be taken not to make the runs sound sloppy. When given proper attention, bass runs not only add an interesting variation to hymn playing, but allow an interesting interplay between the left and right hands. For this example, you will play a bass run in the second measure of the chorus. 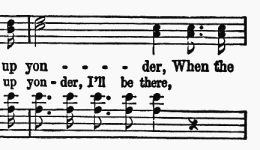 It appears on the syllable “yon-” (the word “yonder” in the soprano line) and lasts for two beats, ending on “-der”. I am confident that you understand the concepts we have been using, so I will not waste space illustrating each step along the way. I will, of course, provide the end result at the conclusion of this example. 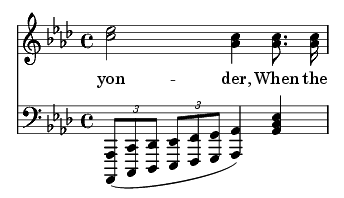 The target note is Ab, which appears in the bass line, on the third beat (“-der” in the lyrics). What rhythm? Triplets, of course! Five notes will fit between the beginning Ab and the ending Ab an octave higher. They are: C, Db, Eb, F, and G.
Since the starting note (C) is in the underlying chord (Ab), no change needs to be made to the run. This run sounds best in octaves, but should be played without the sustain pedal! Sustain the notes in your right hand by holding down the keys the appropriate two beats, and work with your left hand so that the notes come out distinctly, cleanly, and quickly! Make sure that you do not lose the beat when playing a run in the left hand. Just as with the O/C, keeping a steady beat is your highest priority!